1. How do I know which width size should i get? Watches come in different shapes and sizes, therefore the width of the strap will be different. Measuring your lug width with simple ruler is the best and most convenient way. Please refer to the picture below. 2. How do I know which length size should i get? The strap length suggestion is based on wrist size. To determine the your wrist length, you can simply wrap a piece of string/thread around your wrist at the point where you normally wear your watch, mark the string where it crosses itself, lay it flat on a table and measure the distance between the marks. This is your wrist size. Please see the picture below. The chart above is only general advice from us. That being side, you are free to choose which length do you prefer. There are people with same wrist size, order different length strap, and it happens couple of times. However, the majority 95% of our customers happy with the result using the guideline above. 3. I want to make the length of the strap just like the one which come with my watch (original one). Sure, you can measure your existing original strap with simple ruler. Please be noted that every original straps may have different length although it is the same product. If you want to make the strap exactly the same like yours now, we suggest you to measure your old strap first. 4. Do you have women size? All of our strap is handmade and pre-ordered. So, it is fully customisable. 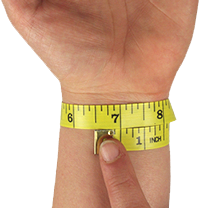 Especially if you’re women, you need to measure your wrist for perfect fit, as the wrist size for most women are not the same.